How can we make sure clean water, decent toilets and good hygiene are a normal part of daily life, for good? Improvements to water supply and sanitation services should deliver permanent benefits to their users. Likewise, hygiene and sanitation behaviour changes established now should last into the future. In many of the countries where we work, the systems and institutions needed to ensure sustainability are extremely weak or non-existent. Communities can struggle to keep services working on their own, and behaviour change improvements can be lost without continual promotion and reinforcement. Services can be threatened by poor management, insufficient financing, limited capacities, poor governance, climate variability, climate change, ecosystem degradation, pollution, and a growing demand for water resources. SusWASH is a three-year initiative aimed at addressing the long-term challenges of service and behaviour sustainability, as well as ensuring the WASH sector can provide services to all groups in society. 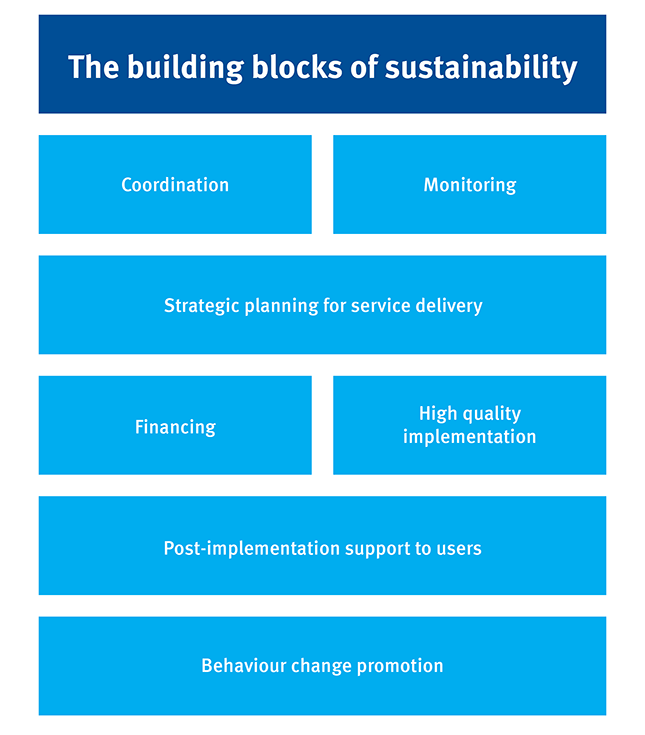 Making sure services and behaviour change are sustainable is a challenge. It requires more than selecting appropriate technologies, holding training exercises, or encouraging community ownership. Hygiene and sanitation behaviour changes will only be permanent with continual promotion of good practices based on an understanding of why people change their habits. Permanent services will only be established if the systems and institutions required to manage, finance and support them are created, strengthened and maintained. Explore our sustainability publications and resources. Opinion pieces and discussions relating to sustainability.